Komplex apartmánů Jestřábí is located near the largest Czech lake – Lipno. Complex of apartments is located less than 2 kilometers from the Černá v Pošumaví at an altitude of 760 m above sea level. 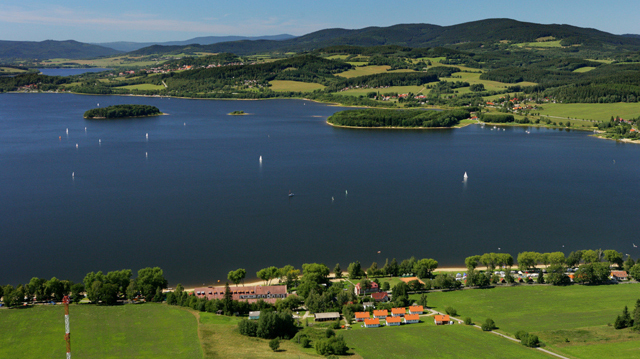 Apartments location is at the widest point of Lipno lake, which provides good conditions for all kinds of water sports, but there are also sandy beaches for relaxation and sunbathing too. The apartments are located in a meadow in natural surroundings. We offer you nice and cozy atmosphere with a family approach. Holiday in South Bohemia promises lovely castles, amusements, swimming in the lake and many other activities. © 2019 Komplex apartmánů Jestřábí.